Wine drinkers who love Pinot Noir and have to watch the bottom line can have a tough time finding good bottles for under $20. I'm not talking about searching for a $15 bottle of Pinot Noir that will rival a $50 bottle from Burgundy or elsewhere. My sights are set lower--I just want a bottle of Pinot that doesn't taste like liquefied raspberry jam. 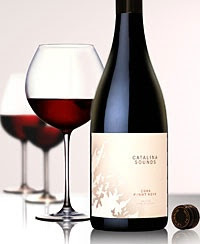 This week I got a reminder that New Zealand can be a good source for such bottles, when I opened up a 2006 Catalina Sounds Pinot Noir from New Zealand's Nelson region ($18.93, Garagiste; available elsewhere for $19-$21). This was a lovely Pinot Noir for under $20, one that managed to be open and lacy without being weak and insipid. And though it was fruity, it did not have the jammy intensity that I think can ruin Pinot Noir. Instead, the wine had raspberry and mineral aromas and flavors accented by a touch of earthiness that deepened them nicely. For me, though, it was the texture of this wine that made it stand out. Texture is important to me when I drink Pinot Noir--maybe more than it is for most people. I want my Pinot Noirs to have a seductive silkiness of texture. This wine had it, the silkiness turning gossamer and airy in the aftertaste. While the wine lacked the complexity to make it truly outstanding, this was a very good QPR bottle--and I would buy another vintage of Catalina Sounds Pinot Noir without hesitation. And note to self: remember to check out the New Zealand aisle next time Pinot Noir is on the shopping list. I don't know about you Dr Debs, but I think we've all got too used to the high prices we've had to pay from French Pinot Noirs in the past that we're not expecting the value plays from New Zealand and California that there are actually for us to have. I, for example, spotted a California Pinot today for just £9.99 that's been wowing anyone who's drunk it - a few years ago I'd have had to be dreaming to see something at such a low price! Indeed, the prices are often reflective of what the market will bear. I wonder if prices wills often slightly as the Pinot Panic fades in favor of some other grape. I remember when Merlot was the trendy red--and the prices rose accordingly. Don't think I've ever strayed away from the central coast of California or Oregon for Pinot.....guess I need to try! Thanks for the heads-up! I would not say I am a expert but I know what I like and how much I am prepared to pay for it. There are a number of New Zealand wines which I enjoy and they are well priced for what you get. The Pinot Noirs from the Waipara region are great drinking if you like a lighter style and the Central Otago ones if you are looking for a bigger wine - both rate up there with the best - or so I think anyway. It is great to see the range of wines being reviewed here - keep it up.